What was the last thing that you ordered online? You may not even remember because buying anything online is just the way that we do things. The only “brick and mortar” store that you may frequent is the grocery store, and even your weekly groceries can be delivered. Why drive to the store when you can order whatever you need online and get it within two days? The same can be true for your window screens. Instead of making time to brave the traffic and drive to your local home improvement store in the hope that they have the screens you need, order it online from a reputable source. With Metro Screenworks, you can! You can’t just order your screens online, you have access to a wide variety of window screen products that can do so much for you than keep the bugs out. Metro Screenworks offers an extensive inventory of window screen products that provide more than just pest protection. We offer window screening materials that can also improve your home’s energy efficiency, protect your screens from the wear and tear caused by pets, and more. We offer traditional window screens as well, but why not utilize screens that offer so much more? Metro Screenworks is a window screen retailer located near Denver in Englewood, Colorado. We have been providing our customers in California and beyond window screens that are of the highest quality, can meet a variety of budgets, and offer so much more than what your local home improvement store can provide. For over 35 years, we have been committed to excellence and to always giving our customers quality-guaranteed screen products, made in the U.S., and shipped same-day. Have questions? Contact us by emailing, calling, or chatting with us. Shop our screen store online. Window screens are a part of our home that we don’t think too much about. Our screens are much like the siding or roofs of our California homes; until there is a problem and they are clearly not working, we don’t really think about them. Until there are flies buzzing around our heads or we are startled to find a bee in our kitchen, we don’t care about our screens. When we at Metro Screenworks say we offer custom screens, we mean that we offer screens that can be made to your size and specifications. We also mean that we offer specialty window screen products. Learn more about our options that can make your home in California be all that you need it to be. Keep reading to learn more about some of our best-selling specialty window screens. Depending on where you live, you may have come to terms with the pollution that you have contact with on a daily basis. Whether you live on the westside of L.A., are nestled in the Valley, or enjoy a coastal sea breeze, your home doesn’t haven’t have to be infiltrated by outdoor pollution. Metro Screenworks offers air filtration window screens that can protect you from pollution, smog, and allergens. We offer air filtration screens in our complete window screens, screen rolls, and more. Enjoy fresh air and protection from pests with Respilon Air and Air Filtration Window Screens! Do you have a billion-dollar view that is obscured by screens? You can enjoy your view without taking your screens off and dealing with the pests by installing invisible window screens! BetterVue and SeeVue are high-quality invisible screens that are made to allow you to enjoy the view out your window while offering you the same protection that your traditional screens do. Our invisible screen still offers the longevity of standard screen, but without the distracting cross-hatching pattern of your screen. No matter where you live in California, it can get very hot. The California sun is one of the best things about living where you do, but it can also be quite destructive for your home and your pocketbook. That is where solar screen comes in. Solar screen provides protection against the sun's heat and UV rays, lessening the effects that cause fading, cracking, and premature deterioration of our interiors. Solar screen can also make your home more energy-efficient, by keeping it cooler — saving you possibly hundreds of dollars a year on your energy bill. Instead of putting up with the heat and painful-to-pay bills, install solar screen. We love our pets, but sometimes they can wreak havoc on our screens. Whether it is your cat who likes to climb your window screens, your dogs that claw at the back door a little too viciously, or your puppy who forgot about your screen door and ran through it, pet screen has your back. Pet screen is vinyl-coated window screening mesh that is seven times more durable than traditional fiberglass window screen. You can use it on your windows, your screen door, screened-in porch, and even for craft projects. We provide colored pet screen for craft projects such as hammock-, hat-, or bag-making. We also offer a screen door dog door! Enjoy fresh air and let your pet go in and out as they please. Retractable window screens provide ultimate customization for your screen needs and when you invest in a Genius window screen product you can rest assured that you are installing quality. If your HOA won’t allow a screened-in porch, you don’t want to obscure your view, or you are tired of opening your screen to let your pet out, retractable screens can be a perfect choice for you. Get ultimate versatility with retractable screens. Before we discuss our specialty and custom screens, we should talk about why we need window screens. Most of us have grown up with window screens and may have gotten so used to their presence that not having them doesn’t seem like a big deal. As a result, replacing or repairing them isn’t our first priority, especially if the honey-do list is long. However, our window screens are a necessary element of our California homes and here’s why. Before window screens were an essential part of our home’s building materials, people lived with flies and other pests. Flies, mosquitoes, and other pests weren’t just annoying, but were a source of disease and greatly affected the health of people across the country. During the Civil War, screen was used as packaging for cheese and was nailed across windows to keep these pests out. As a result, common and sometimes fatal diseases that were spread by six-legged pests decreased. Using screens almost eradicated some diseases in the U.S. altogether. Read more about the History of Screens. On the other hand, having window screens allows you to fully experience the health benefits of fresh air. Maintaining your physical and mental health requires regular immersion in fresh air. It also requires the refreshing of your indoor air. Due to stereotypical living conditions, it is easy for the air in our home to become polluted and stale. Open your windows frequently to get fresh air. Getting the right window screen installed starts with measuring for your replacement window screen accurately. 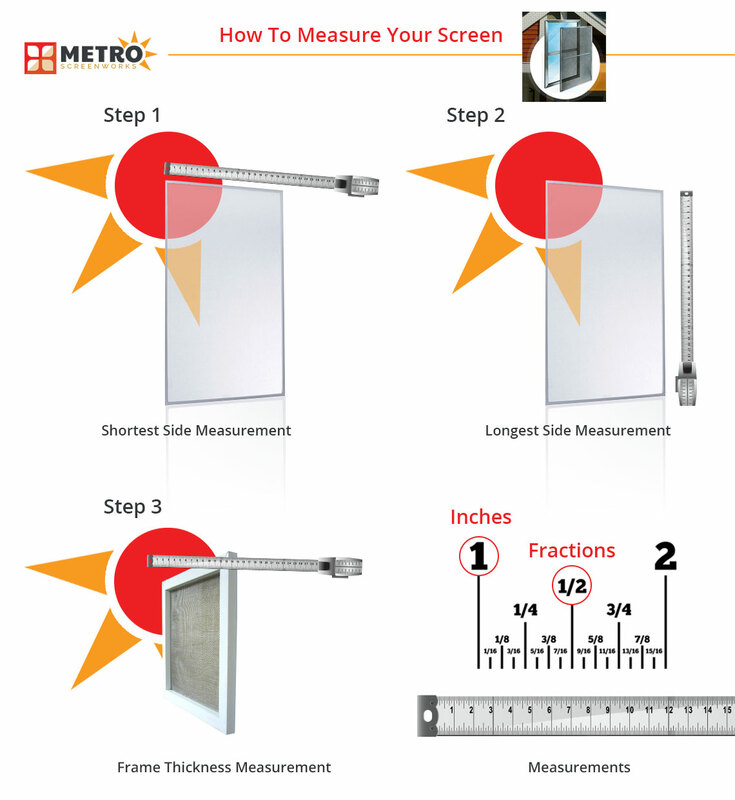 When you order from Metro Screenworks, we can guide you through the process of measuring for your new screen. However, the final measurements are up to you. If you’re unsure whether you have the right measurements or have any other questions, please feel free to contact our window screen experts! We would love to help you. Contact, call, email, or chat us! Measuring for new window screens can feel a little intimidating, especially if you are new to DIY-ing or aren’t the one who normally takes care of home maintenance. However, there is no need to be! All you need is a pen and paper, tape measure, and the knowledge of how to do it right! If you still have your old window screen, you are in luck! Simply measure your old screen to get the right measurements. First, measure the shortest side of the screen to the closest 1/16 of an inch. Next, measure the longest side of your screen to the closest 1/16 of an inch. Have questions? Contact, email, call, or chat us! If you don’t have the original screen, getting the proper measurements can get a little tricky. Thankfully on many California homes, tract-living, and apartments, the same size screen will be used on other parts of the home or you can borrow a screen from your neighbor and measure that. However, if you don’t have a screen or simply want to make sure that you will get the right size screen, here is how to measure a window. First, you must find the lip of the window where your screen sits in the window frame. Once you’ve found that, measure from the lip up to the window screen channel above, then subtract ⅛ of an inch from the measurement. 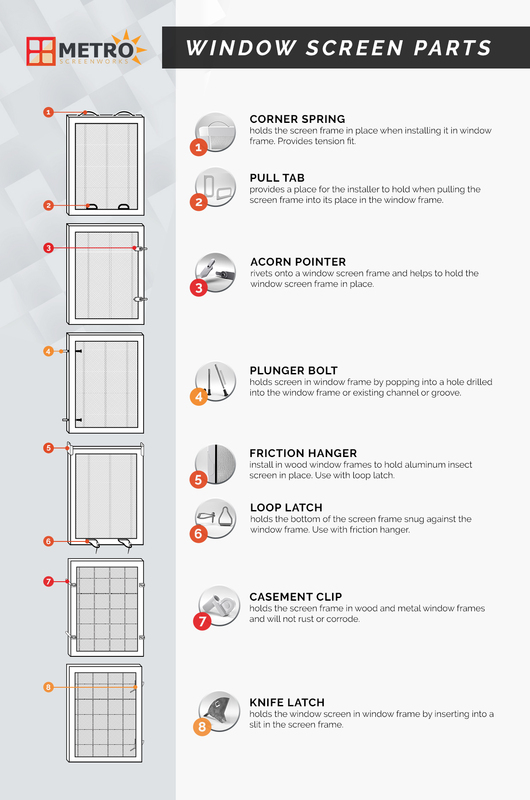 Next, find your window’s horizontal window screen channel and measure. Then, like above subtract ⅛ of an inch. After you have measured the actual window screen, you must look at the hardware that keeps your window screen in the window frame. You can get a screen that is the right size, but still not be able to use it, because the window screen hardware doesn’t work with your window frame. See the diagram below or contact us! If you aren’t sure what kind of window screen hardware you need, contact the window screen experts at Metro Screenworks! 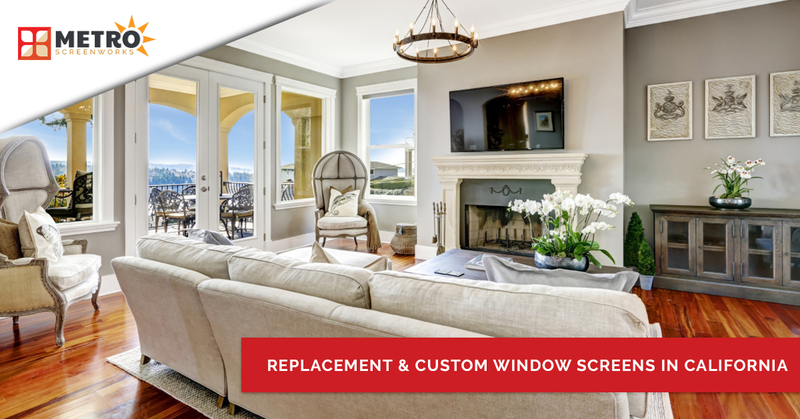 We would love to help you make sure that you get the replacement and custom window screens you need for your California home. Want to learn more about window screens, how to screen-in your porch, and more? Read the Metro Screenworks blog! We post regularly about all that you need to know about screens, necessary home maintenance for your California house, and more! Read our archives or read recent posts below.